Rebecca Mueller participated in a Global Studies faculty-led program abroad to India. She is a Global Studies and Spanish student, with a minor in French, on the Waterloo campus. The interconnectivity of today’s world is powerful beyond belief. With a simple Google search, we have the ability to catch a glimpse into the lives of people living on the other side of the globe. Accompanying such possibilities, however, are also several challenges. Many misperceptions, both negative and positive, arise from the limited, misleading, or inaccurate portrayals of what a place or group of people is really like. Simply hearing anecdotes from close family and friends who have travelled—or even travelling to a country ourselves—should not signify that we understand the everyday realities for diverse groups of people and places. As I have come to believe through my time in India, the best way to even begin to unpack the complex realities of strangers on the other side of the world is to think critically. We must open our minds, challenge our assumptions, and never stop desiring to learn more. 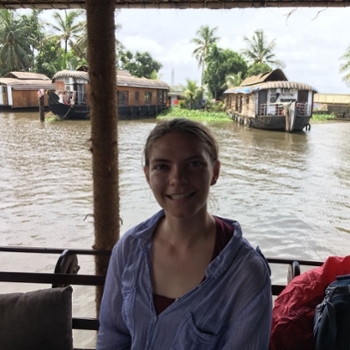 This past spring, I had the opportunity to take part in a field course, GS488: Critical Pathways to Development, with Professor Abraham in Kerala, India. The opinions and questions of Professor Abraham, Professor Mehta, and a multi-disciplinary group of eager Laurier students provided fuel for constant learning. Throughout the trip, our discussions centred around changing perceptions and how we could further challenge the environment we were experiencing. Kerala itself, for example, embodied the opposite of what I had always imagined India to be. The cuisine of this southern state differed from the northern Indian style of food that one might find at an Indian restaurant here in Canada. The lush forested areas and down-to-earth architecture of Laurie Baker contrasted the images in my mind of the busy streets of Delhi. India is the seventh largest country by land mass and the second largest by population; assuming that the customs and landscape were homogenous across its entirety was ridiculous, yet it was taking notice of the obvious misperceptions I had that helped me think critically about other aspects of the trip. Almost all of my friends and family had warned me to be careful and to stay safe on my trip, likely picturing danger and poverty. Yet what the course centred around was what is known as the “Kerala Model,” the state’s rapid process of development over the recent years, improving in areas like women’s rights, economic empowerment, and literacy. We had the opportunity to visit women’s development centres, seeing the way in which NGOs played a role in empowering female entrepreneurs and creating taxi programs driven by women for women. We had the opportunity to visit other advancements such as a technopark with kilometres of buildings dedicated to technological developments and start-ups. We even visited the country’s space centre. The unique aspect of taking a field course is that you learn not to simply take things at face value. In the same way that, during a lecture, we might analyze two papers or points-of-view, our debriefs allowed us to continue our critical thinking and question these experiences; the taxi program was one thing which we quickly began to dissect. Does protecting women from violence by simply providing them an alternate route home solve the root of the problem? Does is perpetuate the cycle? Another surprising aspect of the trip was the number of communist shrines and symbols painted on the sides of buildings. Kerala is the second-ever state to have democratically elected a communist government. Growing up in North America, communism always had negative connotations, yet living in Kerala gave me the opportunity to understand the politics in a different way. Further than simply considering other opinions of communism, a classmate noticed a potential discrepancy in what communism really entailed. The store fronts and malls available portrayed a society as engrossed with consumerism as we would find back home. My understanding of communism should never have ended with the pages of a history textbook on the Cold War, nor should it end with my observations of a single communist environment. My trip to India confirmed for me the importance of not only challenging perceptions by travelling abroad, but also it also made me realize the benefits of continued critique. When you travel abroad, I urge you to keep an open mind to everything that comes your way. Let it prove your initial perceptions completely wrong—and don’t stop there. Let yourself keep learning. Take on new perspectives. Ask questions. Let yourself realize that you will never understand the true reality of a place until you understand the reality of every aspect of every individual who has stepped foot on the country’s surface. We will never truly know the true reality of anyone besides ourselves, but we will never even come close if we settle for that first little glimpse. Read more about the faculty-led program abroad to India.